Dyna Beads Tyre Balancers. The dynamic way to balance your fleet and large truck tyres. Move up to a Premium Balancing Media for your commercial fleet! Tired of "Clumping" problems with your powder? Increase profits with a reusable media. No filtered valve cores required. Will not abrade inner liner. Clean to work with, no dusty powders or ground glass. Special air drying tools not necessary. Totally compatible with Cats Eye, PBS & TPMS systems. Budget friendly - 12 per case. 8 oz - 32 oz sizes available. Case Quantities - 12 per case. Proven track record since 2000. Properly balanced tyres run cooler, place less stress on suspension components, increase fuel mileage and help reduce driver fatigue. The FLEET bead is twice the size of our Standard bead and will not pass through the valve stem. It provides extremely long tyre life, never clumps with moisture, and is reusable. If you’re a fleet manager or an independent owner/operator, you’ll immediately notice the difference that a superior quality, more efficient balancing method can have on any of your vehicles, including higher mileage, longer tyre life and reduced driver fatigue. 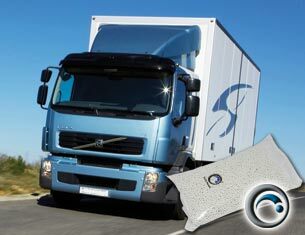 Start reducing your operating costs and maximizing your mileage and wear with the superior tyre balancing solution. A balancing product that is nice and round with a smooth surface can only perform properly if it stays that way over many thousands of miles, especially important for Fleets. An important feature of ceramic for use as a balancing media is the relative hardness. The harder the material, the longer it will maintain it’s original shape and effectiveness. Dyna Beads are 100% solid ceramic! If you use another product right now, you are probably familiar with rubber dust in your tyre. This is not a good thing. This rubber dust was your delicate inner liner before one of the abrasive materials at the left starting grinding it away. Your inner liner has one main engineered purpose: to block internal air from permeating the rubber carcass. As the liner gets thinner, it may affect it’s ability to retain air. If you look at the enlarged photographs, you can see why these materials are abrasive. They have many small, sharp, rough edges. Because they aren’t round, they have to “slide” around the surface, and the sliding friction, coupled with the abrasive texture, simply eats away at your inner liner. Rubber dust is another reason why filtered valve cores are recommended for tyres using abrasive products. 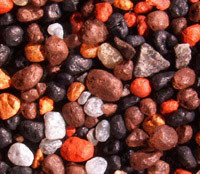 Now take a look at Dyna Beads. There are no sharp edges, it’s extremely smooth, round, and solid ceramic. Dyna Beads “roll” around the inner liner, and won’t grind away your inner liner in the process. Which product would you rather have against your inner liner? 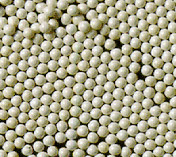 NB: We recommend that you use the Large Fleet Dyna Beads for your commercial applications. However, should you wish to install via the valve stem you will need the standard size dynabead and an Applicator*. 1) Are you going to put the Dyna Beads into tubeless tyres when fitting the tyres? If yes use FLEET DYNA BEADS. 2) If the tubless tyres are already fitted to the rims, are you going to break the tubeless tyre beads & pour the Dyna Beads into the tyre? 3) If the tyres are already fitted onto the rims & you do not wish to break the tyre beads? Use STANDARD DYNA BEADS installed thru the valve stem with an APPLICATOR. 4) Are your tyres tubed? If yes use STANDARD DYNA BEADS installed thru the valve stem with an APPLICATOR. You will be asked during the checkout process to choose Std or Fleet Beads.